As we know the 7th Pay Commission recommendations took effect from 1st Jan 2016. Though 7th Pay Commission has recommended for using the same series of Consumer Price Index (Industrial Workers) with Base 2001=100, DA Calculation formula used for 6th CPC Pay will have to be revised as DA to the extent of 125% will be merged with Basic Pay on implementation of 7th Pay Commission recommendations. In other words, DA on 7th CPC Pay with effect from 1st January 2016 will be reset to 0%. 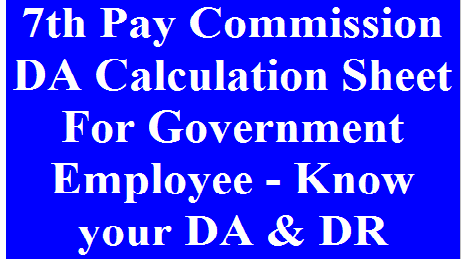 New DA Calculation Formula based on CPI (IW) after 7th Pay Commission implementation will be as follows.